Funny how things turn out, I watched Deliverance on TV last night and this was going to be a piece about Roger Ebert's two and a half star review of the film and how he got it so wrong about what is obviously a classic. 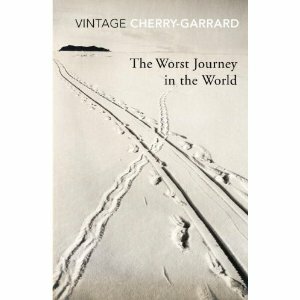 But in reading Ebert's review I was pretty surprised to see that he spends most of it talking about one of my favourite books: The Worst Journey in the World by Apsley Cherry-Garrard. ACG was a member of Scott's ill fated expedition to the South Pole and when he came back he wrote a book about the winter journey he made with two other men to get the eggs of the emperor penguin. It is really the stuff of nightmares: perpetual darkness, temperatures of -40 degrees, inadequate food and supplies and all for a scientific quest which turned out to be completely pointless. The two men he went with on the winter journey for the eggs, subsequently went with Scott on the summer journey to the South Pole and died with Scott and his entire team. I read The Worst Journey in the World in high school and didn't really appreciate it. But then I read it again when National Geographic Magazine picked it as the #1 adventure book of all time, calling it the War and Peace of travel narratives. I think they're right about that. It's an amazing book, telling a grim story in beautiful prose. You can read more about ACG's tragic life here and more about the disastrous Scott expedition here. Roger was wrong about Deliverance but I'm going to let him off this time because of our shared love for this strange, dark, brooding, lyrical, wonderful book.